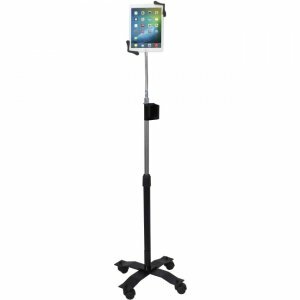 Create a mobile, adjustable workstation for your tablet with CTA Digital's Compact Gooseneck Floor Stand for 7-13 Inch Tablets. This stand is without equal in adjustability, featuring a powerful, flexible gooseneck and a tilting headpiece with easy 360-degree rotation. Customize your workstation further, with the stand's height-adjusting, telescoping pole and attachable storage cradle, perfect for an external battery pack or a stack of business cards. The included swivel casters attach effortlessly to the stand base, giving your stand easy mobility in your home, office, living room, classroom, or retail space. The quick-adjusting tablet holder slides open and secures your 7-13 inch tablet by the corners, leaving ports and buttons fully accessible.